Before you leave home, make sure that all of your luggage is clearly labeled with your full name, your address in Mexico (if you know it), and also the name and the address of the IBERO, attention Subdirección de Intercambio Estudiantil, Prolongación Paseo de la Reforma 880, Lomas de Santa Fe, México, D.F. C.P. 01219. The phone number of our office is (5255) 5950 4243. At the airport make sure you have all of your luggage. It will be very helpful to cash some money from your home country into pesos upon arrival. There are various banks or money exchange offices in the airport where money can be exchanged for pesos. Students who have made prior supervised university housing arrangements will be met at the airport by a member of their host family. Upon arrival in the Mexico City Airport, we recommend that students take only authorized airport taxis. To make taxi arrangements, proceed to an authorized taxi stand which will be indicated by signs. Have a card with your Mexican address typewritten correctly, and hand it to the person in charge. He will indicate the rate to your destination which could be approximately the equivalent of $20-30 USD. You will have to pay with mexican currency. You will be handed a receipt and your address card. Give the receipt and your address card to the taxi driver. Tips are appreciated. 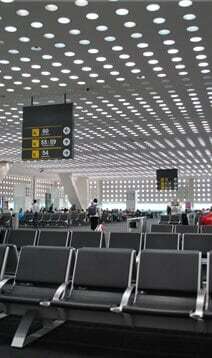 When you arrive in the Mexico City airport, you will pass through customs, and you may have to declare certain items. A system of signs operates in the customs halls to help you through the procedure. There are signs which say “Nothing to declare” and “Goods to declare”. The lists below give details of Duty Free Items and Prohibited and Restricted Goods. Clothing and other personal belongings. Baggage weighing 22 kilograms (50 lbs) per person. Check with your airline to determine if you can take two 22 kilo bags of luggage on your trip. Up to 50 books or magazines. For adults only, 20 packets of cigarettes. One camera and one video camera. One musical instrument provided it can normally be carried by one person. One camping set with its equipment for camping purposes. One set of fishing tackle. One pair of water skis. These include controlled drugs (such as marihuana, opium, heroin, morphine, cocaine, cannabis, amphetamines, and LSD), firearms, ammunition and explosives, knives or other sharp pointed items, counterfeit money, meat and poultry, plants, bulbs, trees, vegetables and fruit, and most animals and birds (whether dead or alive). Mexican Consulates will furnish detailed information on items not included in the above mentioned list. Two sets of dress up clothes. There are many discos and restaurants that have a dress code. A coat and a tie for men are necessary when visiting some restaurants. Combination of shirts and blouses (T-shirts, dress shirts/blouses). Four pairs of pants (jeans, cords, sport) and/or skirts. Socks or stockings for two weeks. Warm clothes are advisable for late fall & winter. A pair of comfortable walking shoes. An umbrella and light raincoat. Bathing suit, sun hat, sunglasses, lotion and/or sunscreen. Light robe, slippers or thongs for home or beach. Do not bring valuable jewelry or clothing that needs special care! An iPod with your favorite music. A journal for writing down your thoughts. Shoulder bag. It should be large enough to carry a map, camera, umbrella. A second pair of eyeglasses. Hair dryer, electric razor, etc. Personal toiletries, although you may buy these in a pharmacy or supermarket in Mexico. A snapshot of your family will interest your Mexican friends. Money belt and/or fanny pack. Mexico City operates on the same electrical current as do most cities in the U.S. Adapters are not needed for items such as razors, curling irons and alarm clocks. Expect occasional power failures in your neighborhood. A small flashlight can serve many purposes, particularly when traveling. Do not bring sophisticated electrical appliances or instruments. You can buy an adapter for plugs with two sized prongs at a minimal cost if needed. If you are under special medical treatment, be sure to bring all necessary medication that you will need while in Mexico. Bring a doctor’s note to validate your need for the amount of medication you are bringing. You might need this certification while going through customs. To get to the IBERO on public transportation, students should go to the “Observatorio” or “Tacubaya” metro station (both on the pink line) and take a “microbús” or “combi” with a front sign saying: “Centro Comercial Santa Fe” Sometimes “UIA” or “IBERO” will also appear on the front sign. Ask the driver for a drop off at the IBERO at Gate 10 on Vasco de Quiroga Street. You will be asked to present an ID at the gate. Show your identification and tell the gate employee that you have an appointment in our office. Walk toward the campus. You will see an outdoor cafeteria to your right. At the beginning of the cafeteria area, turn left and walk down the pathway into building F. Our office is located in Building F, ground floor, and you will see a bulletin board decorated with flags to the right of the entrance. Building F is also color coded with a yellow sign. Students should not flag down taxis on the street. They should use only taxis from a Sitio, a registered taxi station. When calling a Sitio, the taxi station will send a taxi that will pick students up wherever they are. Students should consult the yellow pages under “Sitios de taxis” to find a taxi station near by. Prices will range from around $100-150 pesos depending on the length of the trip. Prices are estimated for an approximate amount of US dollars. The currency of Mexico is the Mexican peso. You can only change USD or other international currency into pesos at currency exchange offices located in many parts of the city.